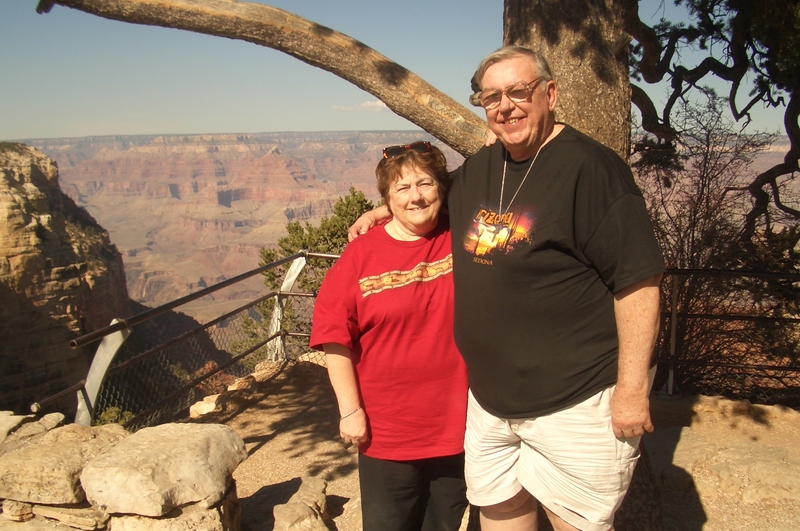 Frank and I are at the Grand Canyon in this photo taken in 2008. Today is Sunday…the 26th…our tenth anniversary…yah! Computer has been on the blitz for several days. Hopefully I can get this typed and saved before I get zapped! Just realized this morning while getting ready for church, that my life is controlled by little white pills. For some reason I don’t pay that much attention to the pills I take in the morning. Lately I have been seeing a new doctor who has taken away several of my usual pills and put me on new ones. Today I took a close look because I was in a rush and thought I had already taken such and such a pill…started pouring out the pills one by one and saw that they are all white…and little..almost identical…but with different markings on them. I am sure I am not the only one who struggles with taking those stupid pills…I now realize the control they have over my life. One pill helps me regulate sugar, one helps me pee, one helps me stay under control, one keeps me from having asthma, one keeps me from sneezing, and one keeps my blood pressure down…whew! Seems like I would fall completely apart if it weren’t for these pills!! Do you feel this way? Just think, my doctor just doubled one of those little pills and added a new one to keep my cholesterol down. I bet that *&$% pill is white, too! This photo taken a few years ago on cruise ship.